Home › Blog › Which Toothbrush Is Best? BACK IN THE GOOD old days before the 1930s, toothbrush bristles were made of animal hair. We’re pretty happy to live in the era of nylon bristles, but how can we tell which toothbrush will be best for our teeth and gums? How hard should the bristles be? Are electric toothbrushes better than manual ones? It’s true that hard bristles make it a little bit easier to scrub away the plaque from your teeth than soft bristles. It isn’t worth it in the end, though, because those hard bristles can also scrape away enamel and even agitate your gums to the point of putting you at greater risk for gum recession, which could be permanent. In the case of hard bristles versus soft, the costs of hard bristles clearly outweigh the benefits, which is why dentists always give out and recommend soft-bristle brushes. In the past, there wasn’t a significant difference between the effectiveness of electric toothbrushes and manual ones. However, the technology has come a long way, and modern electric toothbrushes are better at getting plaque out of hard-to-reach spots. Electric toothbrushes reduce plaque by up to 21 percent more than manual toothbrushes and reduce the risk of gingivitis by 11 percent more. Using an electric toothbrush also makes it easier to brush for the full two minutes and less likely that you will apply too much pressure. That still leaves a lot of different electric toothbrushes to choose from. Luckily, whether you choose an oscillating brush (spinning tops) or a sonic brush (bristles vibrate from side to side), you’ll still see better results than with a manual brush. If you aren’t sure which brush would be best for you, feel free to ask us about it at your next appointment! Once you’ve found the ideal toothbrush, it’s important to store it properly so that it doesn’t become a breeding ground for bacteria. Store it upright somewhere it can dry out, preferably as far from a toilet as possible. Finally, don’t forget to replace your toothbrush (or the head of your electric toothbrush) regularly because even the best bristles fray and lose their effectiveness over time. 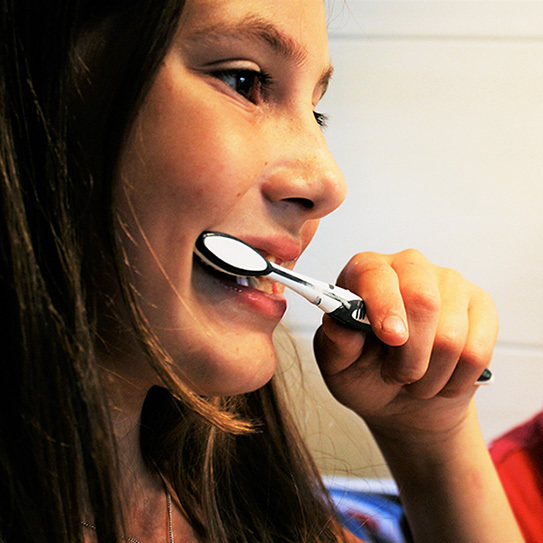 Watch the video below for a few more tips about brushing your teeth! Having the right toothbrush and taking proper care of it are essential to good dental health, but there’s no replacement for regular professional dental cleanings. Make sure you’re scheduling appointments twice a year! We look forward to seeing you soon. Good habits and the right tools make all the difference for your teeth! ‹ DIY Teeth Whitening Trends: Fact Or Fiction?